Note: I wrote this before it was revealed that these tattoos may not be on the final product. It was originally written for Wolf in a Gorilla Suit but it quickly became irrelevant with news of it just being a promo shot. Not wanting it to go to waste, I figured I'd post it here. So enjoy. Or don't. 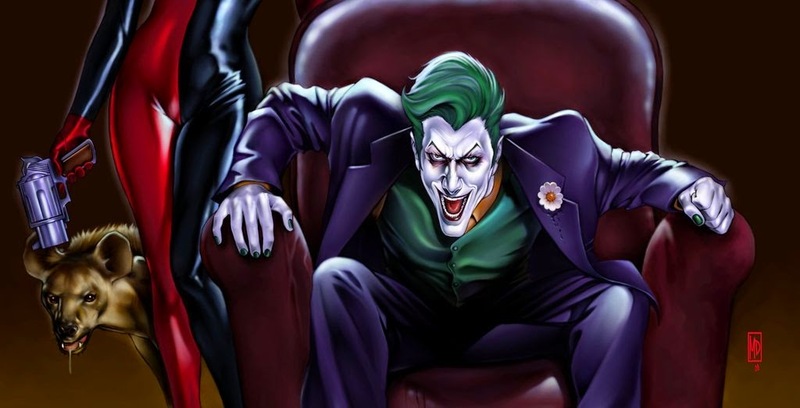 For a more positive opinion of Leto's Joker, check out Lillith Sinclair's take on it HERE! First off, I should say that I haven't enjoyed the "Snyder-Universe" with DC. I think that he just tries a lot of ridiculous things that he can't pull off (see: the entirety of Man of Steel). I also have really disliked the reveals coming out of the DC side of things. I found the Aqua Man reveal ridiculous since it was treated like an Abercrombie and Fitch Ad, complete with "The Chive" level text block covering him. Add that he simply looks like The Rock in Hercules and it's hard not to crack a smile. Then they reveal the Batman v. Superman trailer and we get treated to some sweet video game footage. Seriously you should see these graphics, they're out of this… wait what's that? Those are real human beings and this isn't coming to an 'Xbox One' near me? Next you're going to tell me Lego Batman doesn't make an appearance. These wouldn't be such huge problems if we weren't seeing Marvel handling things so much better. They've stuck true to the characters, adapted famous storylines from the comic's history, and cast actors that are right for the role, forgoing big names and thus big ego's. Meanwhile Warner Bros. (I wish I could say DC but they don't have much choice in the matter versus marvel who controls nearly everything) has made character changes just to appeal to the 2015 crowd. Remember movies that pander to the audience without providing much depth? Yeah, those don't exactly last long in the cultural lexicon. Which is where the issue of The Suicide Squad's Joker comes into play. A picture of Leto as The Joker has been released and it's hard not to laugh when seeing it. The Clown Prince of Crime has been turned into a grill wearing, tattooed cholo. As someone who's read Batman since he was little, such a drastic change is baffling considering how strong the source material is, especially in the current run of comics. 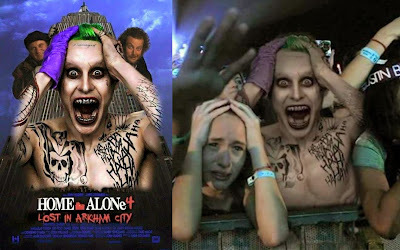 Leto's look would be fine if he were playing a gang member obsessed with clowns with access to a really good tattoo artist (seriously look at those tattoos, they're insanely good quality). You know, like the ones you usually get in prison. A cheap route I've seen taken often during the debate of whether Leto's take is good or not, is to bring up Heath Ledger. It often goes something like this "Oh my god, people hated when the first photo of Heath came out. You just have to wait and see the performance." And the issue comes with the last bit of that sentence: 'wait and see the performance.' Umm… what does his performance have to do with anything? This is all about the physical appearance of the character. I've been saying since day one that Leto would make a fantastic Joker, but that doesn't make his appearance any less of an issue. I thought Willem Dafoe made a fantastic Green Goblin in Spider-man, but it doesn't mean his costume wasn't any less terrible and Power Rangers-looking. The performance and look are two entirely different things and, especially with this debate, that fact seems to be lost on people. 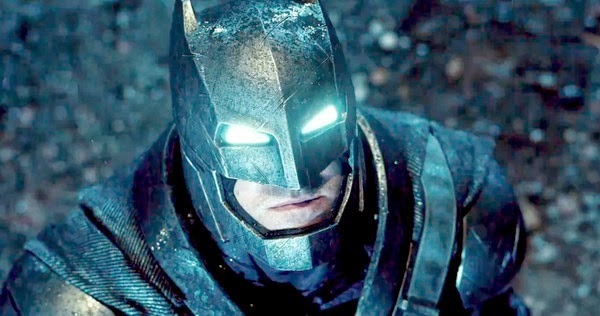 If Batman suddenly had a full beard sticking out of his cowl, I'd have a problem. Some may say, "but why be mad about that, it's so minor that it doesn't matter." Except it does. Him having a beard suddenly means that he's more recognizable out of the suit, not to mention that the whole persona of Batman is out the window. The beard makes him human. And there goes the fear. "But what about that one issue I saw where Batman has a full beard? See, proof that it represents the comics." And this is where a lot of non-comic fans come into play, is that people don't understand the idea of "annuals" and "one shots." Sure, there are random instances of out of character moments that still fall in line with "canon" but those moments don't represent the character as a a whole and as such, should not be basis of what that character is. Just because I had a month in High School where I dyed my hair black and wore chains around my wrists, doesn't mean that should be representative of me as a person in the grand scheme of things. Out of character moments happen. These stories are often "non-canon" and usually represent unique takes on the characters outside of the established world. And this is where a lot of the major character changes happen. And it's where they fail. Very few of these transcend their original intent and actually become canon. 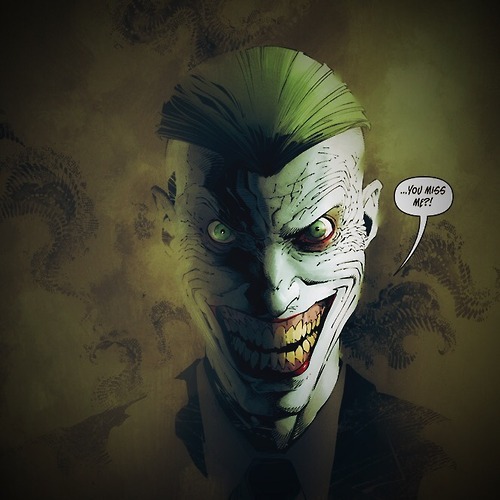 This isn't even something that should have to be brought up but with the litany of "Well the Joker looked like THIS, in this comic" happening in order to defend it, I felt those people should gain a further understanding of what "canon" is. 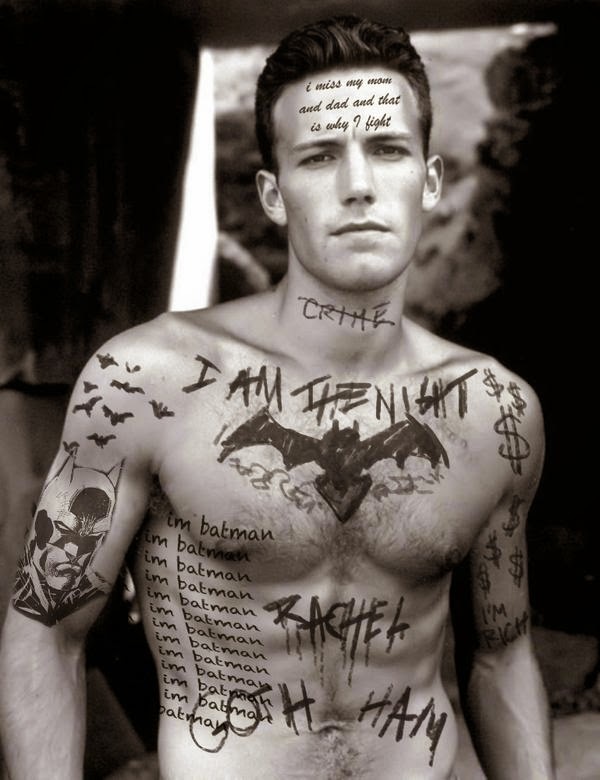 The Joker having a lot of tattoo's is not canon. 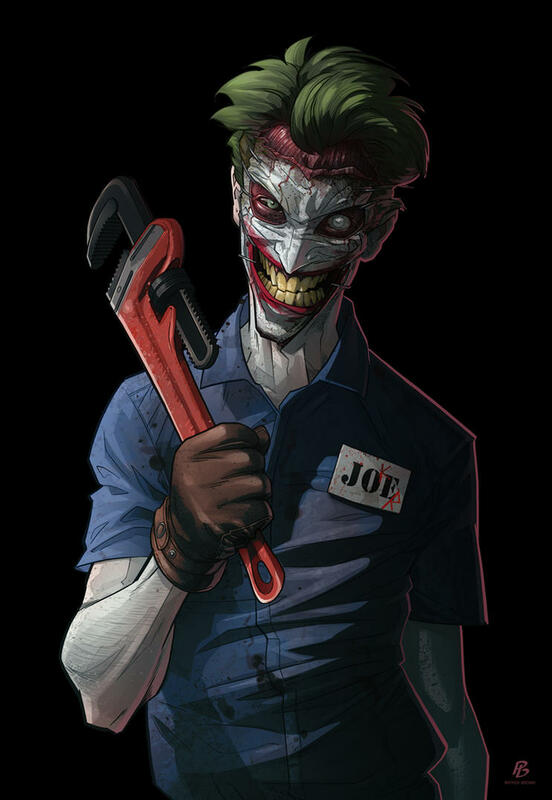 In the current iteration of The Joker (which exists in New 52's Batman) he doesn't have tattoos and this is the ultimate "canon" Joker, getting rid of any events that are collectively disliked and leaving only what the comic world sees as The Clown Prince of Crime. If The Joker is going to get a tattoo, then it's going to be the map of the prison he's in so that he can bust out or of a dead Robin, just to get into Batman's psyche. I can theorize about these things and not get torn apart because that's the person that's been represented in comics for 75 years. When a personality, represented here by his appearance, has been so well established for so long, to suddenly change it in order to be hip, it doesn't make a whole lot of sense to me. And that's the main issue with the appearance: it doesn't represent his personality at all. Would Joker really sit in a tattoo chair for that long just to have a bunch of cliche nonsense perfectly written across his body? "Maybe other inmates tattooed him!" Okay, then shouldn't the tattoo's be a bit sloppier due to either struggle or the fact that it's a tattoo being done in prison? Just making them look like crap would have actually made me enjoy them more since then they wouldn't just appear to be photoshop monstrosities. "What if Harley did it? That would be cool! And it's explain the content of the tattoos." Would it? Joker's whore, who he treats with no respect or regard, is going to put a lot of stuff on his body that she would want? Me thinks not. With that in mind, I can get past the tattoos. 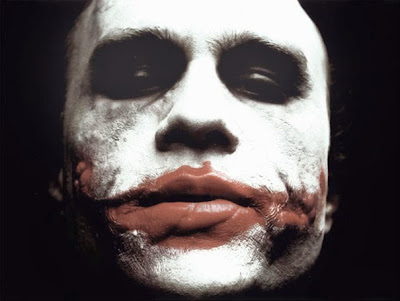 As I said, there are instances where I can see The Joker having them. But that's not where the issue lies, it's that the tattoos he does have are juvenile and representative of poor writing. Really, he needs to have "Damaged" on his forehead? And a tear drop "J" under his eye? I mean, I'm glad that Hollywood is giving 13-year-old emo kids their turn at screenwriting but does it have to be at the cost of one of comics most high-profile figures? Then there are the "ha-ha's" written all over his body. In a comic booky font no less! Because, you know, he laughs a lot and we wouldn't be able to get that across otherwise. And on top of that, he has chrome gangster teeth. Because, they really just didn't think he looked enough like a Mexican Gangster so they figured they'd take it a little further. I'm assuming that we're gonna see a lot of The Joker's underwear as his inmate slacks hang below his crack, and his chrome dollar sign chain sways back and forth around his neck. God, it's really hard not to hate everything about this. 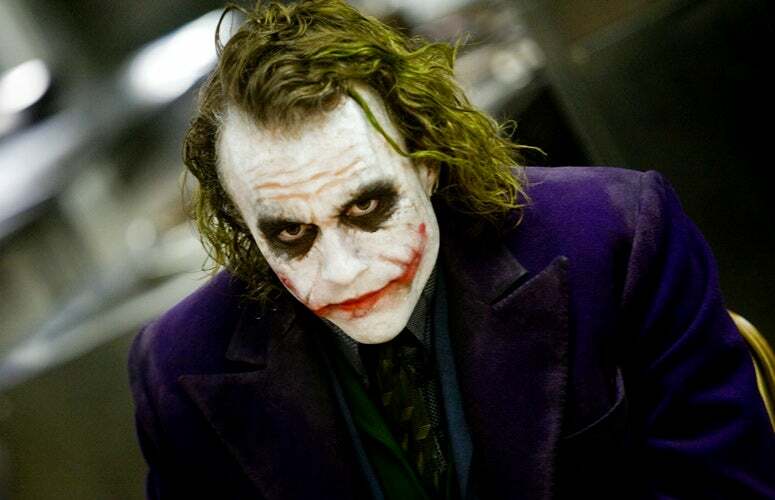 "It's silly, the Joker is supposed to be silly." having or showing a lack of common sense or judgment; absurd and foolish. Silly? Well according it it's definition, that doesn't sound anything like the Joker. 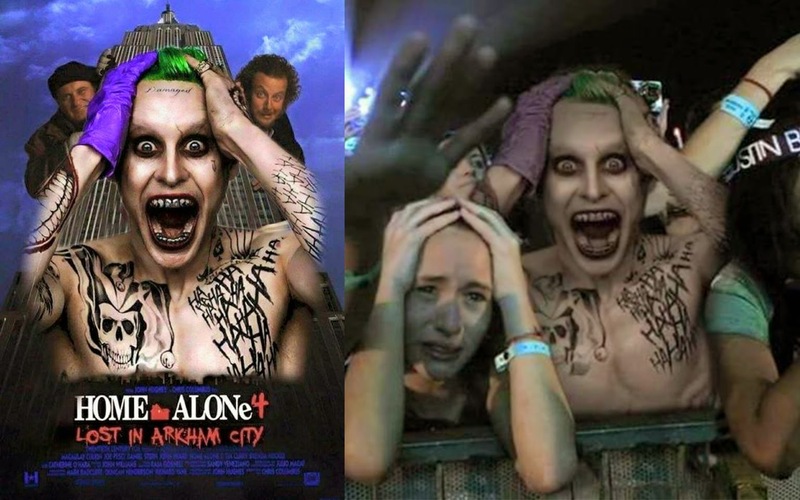 No, the Joker is supposed to be crazy. I'd say that the silly thing were true if the only Joker I had been exposed to was maybe Nicholson and Romero (and even with Nicholson, that's pushing it). But since I live in 2015 where this, this and this exist, I'd that's not the case. In the end, it's all simple really: Marvel is a comic book company making comic book movies and Warner Bros. is a movie studio making comic book movies. Doesn't take a genius to see who would have a better grasp on the source material. The sensibilities involved with each series have been clear since the beginning. The DC side of things are trying to be different at the cost of what made the characters who they are and as someone who genuinely enjoys the characters that have been established in 75 years of comics -- and with what Marvel has done -- it's hard to watch so many iconic characters be reduced to pop culture comedy fodder. Is the entire thing a lost cause? I don't believe so. Leto will be able to hide most of the tattoos with whatever prison garb they put him in and given his past roles, I'm sure he'll be able to give us a serviceable Joker. And I truly hope he does. Just like I really hope that Jesse Eisenberg knocks it out of the park as Lex Luthor. "Bruce Wayne would never do that." Neither would The Joker.